It is important to compare sewing machines before you buy one. Many people keep their sewing machines for years, so it is important to get it right. So, how do you know what to look for when purchasing a sewing machine? One of the key questions to consider is what you need in a sewing machine. This may be based on the type of sewing you plan to do. If you are going to sew lots of large and heavy upholstery items, consider an upholstery sewing machine . If you do fancy embroidery then you will need a different kind of sewing machine than if you are planning to make simple garments. For finishing seams and edges sergers or overlocks are a great addition to any sewing room. The type of machine you need will also depend on your level of experience, so take this into account when you compare sewing machines. If you are just getting started, it can be worth purchasing used machines that meet your requirements. This can also be useful for experienced sewers who are looking to upgrade but need to stay within a particular budget. You might also want to consider refurbished sewing machines as a way to get a high quality machine at a fraction of the cost of a new one. If you have a lot of sewing experience, then you will already have some idea of the features you need in a sewing machine. You will probably consider areas such as threading, speed, the walking foot and the types of stitches the machine can handle. If you plan on sewing a particular type of material such as leather, you might want to look at a more specialized machine that will be able handle heavier weights. Consider leather sewing machines to give you the professional results you want. If you plan to travel around, then having a portable sewing machine in a case or tote can be useful too. Many machines now include LCDs and delicate electronics to provide additional features. One way to compare sewing machines is to look at domestic machine reviews and commercial and industrial machine reviews. These will go into great detail about the machines themselves, the accessories available to help get the job done, the care of machines and other issues of importance. Don't just pick up machines in your nearest superstore; take the time to research them properly before choosing the one you will buy. Consider asking someone with sewing experience for their opinion. 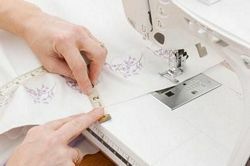 While shopping, consider the best sewing surfaces for your machine. You will also be able to buy suitable tables and cabinets online.